I was so very intrigued by the Yogurt Soup over at Choosy Beggars. However, Tina's yogurt soup was served with shish barak, tiny, tiny, tiny meat dumplings. They looked very labor-intensive, and I cannot have that! So, I decided to make the yogurt soup but add chickpeas instead. We also happened to have a bunch of Swiss chard lying around, so I thought I'd add that too. Well, imagine my happiness when it turns out that there is actually such a Lebanese dish! 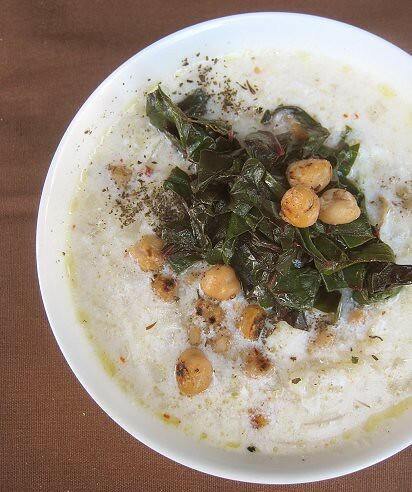 Here's my Shourabit Silq bi Laban (Lebanese Chard and Yogurt Soup). 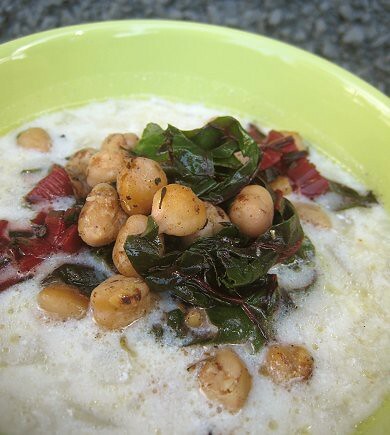 Well, I wanted to say "Yogurt Soup with Chard and Chickpeas", but I had the hardest time trying to find out how. Are chickpeas simply called "hummus"? Anyway, just shourabit silq bi laban it is! I decided to cook the swiss chard separately, wilting them in a pan and seasoning them with salt. 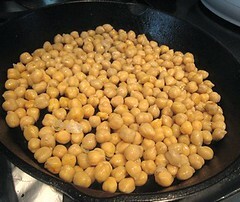 Instead of simply plopping the chickpeas into the soup, I decided to "pan-roast" (or sauté) them first. 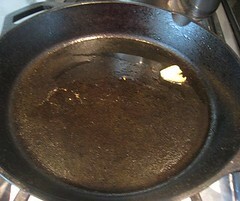 I placed a smashed garlic clove into a pan and started heating it up with some olive oil. I removed the garlic when it started to brown. 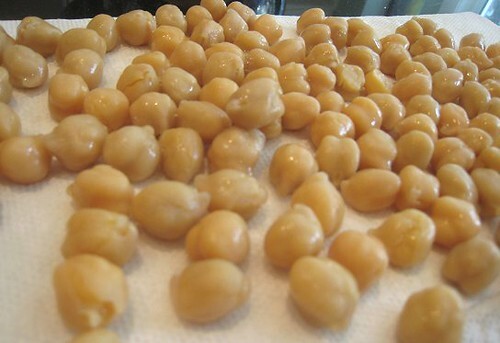 When the pan was smoking hot, I added the drained and dried canned chickpeas. 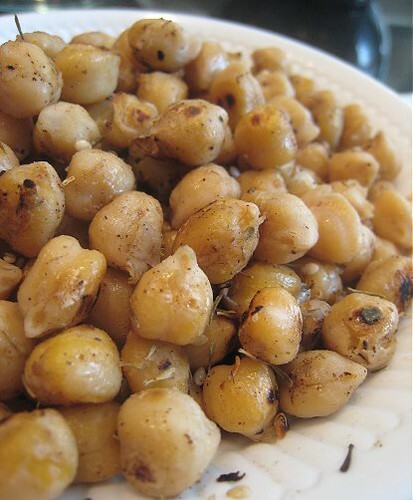 I sprinkled in some za'atar and salt, and cooked the chickpeas until toasted. Making the soup was as simple as following Tina's recipe. 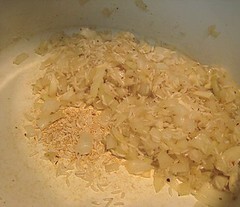 I cooked chopped onions and garlic in olive oil until soft, then added some rice. After a couple of minutes, I sprinkled in some red chili flakes. I added water and cooked the mixture over low heat until the rice was cooked. The yogurt went in last, and I seasoned with salt and pepper. 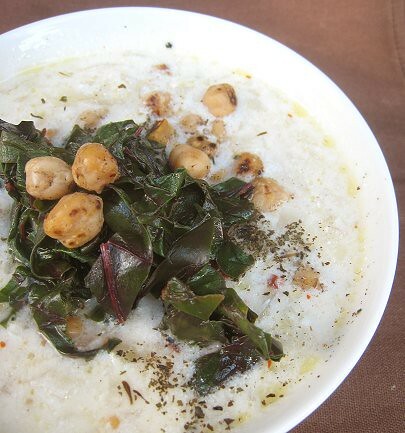 For the purposes of the blog, I ladled the yogurt soup into bowls and added the cooked chard and za'atar chickpeas on top. I even garnished with dried mint. After all the photo-taking was done, I dumped everything into the soup. But, a warning to you all. 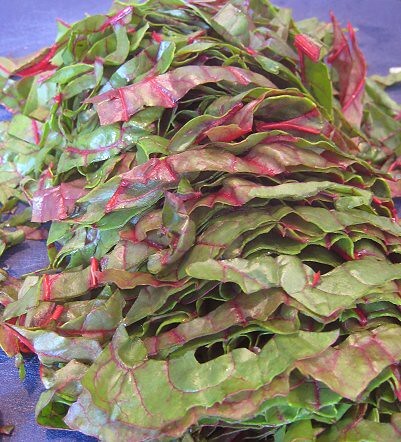 When using Swiss chard, make sure they have white stems and not these red (or even yellow) stems. 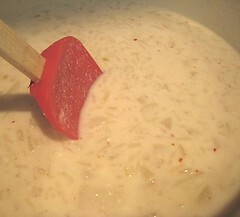 When I looked into the pot the next day, my yogurt soup had turned pink! It was a little disturbing. Say "No!" to pink stems! Anyway, the soup was still delicious. I recommend adding a fried egg to your bowl. The rich yolk melds quite beautifully with the acidity of the yogurt. With that and the greens and chickpeas, this is quite the little meal. My grandmother always used to make an escarole soup with tiny tiny tiny meatballs and I have no idea where she got the patience from! I think your chickpea idea is definitely a good one. I never realized that chard turned things pink either until I left a chard/rice dish in the fridge and went to have it for lunch the next day. wow! i did not expect to see a Lebanese country-style recipe in here! Bravo! i am so happy you are interested enough in our cuisine to try this! Looks great! LOVED this post so much!! How excited was I to see that you tried making yogurt soup?? VERY excited, that's how. Your soup looks fantabulous, and my Dad used to make a really similar one when I was growing up! 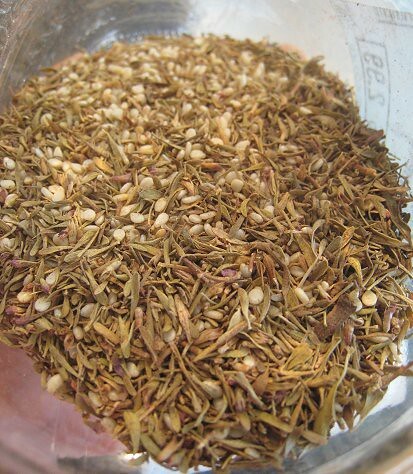 He didn't use any za'atar, but considering that I think za'atar makes everything taste better, I say faster pussycat! Mmmm....and an egg in yogurt soup is the bees knees. 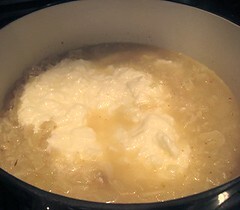 If you don't want to dirty another pan, instead of frying the egg try poaching it in the simmering yogurt soup. Efficient and delicious! By the way, the first time that I ever made soup I did a cheesy chard soup using fresh from the garden swiss chard. With red stems. Yeah. The soup actually tasted good to my 14 year old self, but nobody else would eat my Pepto Pink creation!! Yeah, our meatballs are HUGE. Sometimes, they're not even meatballs, but more patty-like. It reminded me somewhat of an avgelemono soup, but tarter. Thanks! OK, so I was correct, re hummos = chickpeas. Although, I don't know how to say "and". Hehe. Those red-stemmed chard are evil! ;D Poaching the egg directly is definitely the way to go; less effort. Will do that next time. Thanks for the yogurt soup idea! How creative of you to create soup and find out there is a such a recipe! oh my! 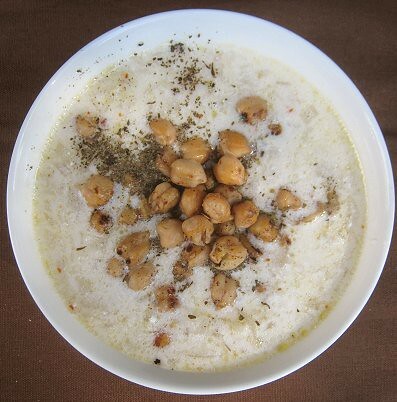 I love combination of chickpea and yogurt, it is so unusual for western world but I am intrigued enough to try it. Spice-frying the chickpeas was a great idea! What a lovely soup. 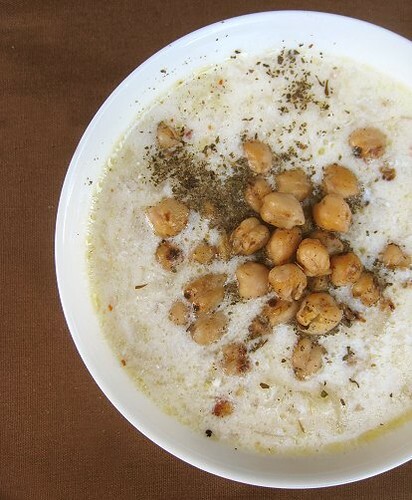 Really like the idea of the zaatar scented chickpeas....actually the pink soup also appeals! You're a much braver soul than us (re the pink soup). Teehee.